In this installment of of our ClearContext v7 preview, we would like to introduce the new quick tasks feature. We have seen the need to easily enter in tasks throughout the day, often while working outside of Outlook, and then be able to organize these new tasks efficiently at a later time. The new quick tasks window is separate from the Outlook window and floats above other windows so that you can work on other documents, spreadsheets or applications and have quick access to creating new tasks as you think of them. This task window is optimized for quick task entry and one can choose to enter only a subject or add additional information. Supporting the creation of these tasks are a listing of recently created tasks to remind about what has already been created, and a new mode in the Organizer that allows one to focus on these recently created tasks. 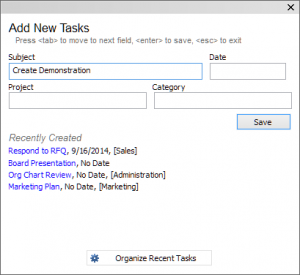 This new task entry and management capability will streamline and expedite the process of creating and managing new tasks. The last phase of development and testing for the v7 beta is progressing smoothly and we hope to make available our first beta version to our Connect subscribers within a few weeks. We will continue to post the latest updates and information here on our blog. New Purchasers: As of September 1, 2014, all purchasers of new or upgrade v6 ClearContext licenses will receive a free upgrade to v7 once the new version is available. We’re excited to start talking about the next major release of the product, ClearContext Pro v7. In this post, we will discuss a few of the new v7 features and our development status. In the coming weeks, we will follow up with more product details and continued status updates. For this initial preview, two areas of improvement for v7 we will share are around AutoFile and Project filing. 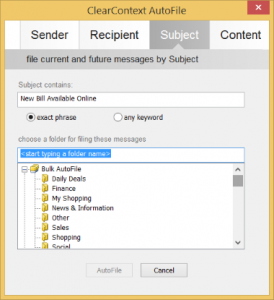 The AutoFile capabilities have been expanded with support for criteria other than sender for filing and the ability to file messages to both the special AutoFile folders and your regular Project folders. For Project filing, suggestions for filing and Project assignment. should be much more relevant due to major improvements to the prediction algorithms. In addition, other capabilities around Projects and filing have been added such as the ability to exclude folders and a tool to move and re-label messages from one Project folder to another. Additional new v7 features will be highlighted in future posts. We are in the process of wrapping up development for v7 and shifting our focus to testing and validation. Once we have completed our initial testing and QA, we will launch the beta testing program. Initially, members of our Connect subscription will have exclusive access to the beta program. As a reminder, Connect is our yearly subscription program for free upgrades, priority support and first access to pre-release software. Please stay tuned for further updates and we appreciate your interest in ClearContext! New Purchasers: Starting now, all purchasers of new or upgrade v6 ClearContext licenses will receive a free upgrade to v7 once the new version is available.